The Captain's Journal » And You Thought The ATF Interpretation On Pistol Braces Was Safe, Did You? Lets say a man takes a job. The job requires an Oath of Office. After taking said Oath, he begins work. The work he begins to do, and which he will do every day from then forward, is an utter violation of his Oath of Office. The man knows this very well, but does not care. He does the work anyway “willfully and deliberately”. Might we consider him a “Good Man” or a “Bad Man”? Lets say a man takes a job as a prosecutor. He knows the purpose of Government is supposed to be the preservation of Life, Liberty and Property, and to ensure the fullest exercise of those rights by all free men. He is supposed to be proecuting bad men who hurt other men, damage property and fail to fulfill contracts. One right which is guaranteed in writing to all free men by the Society’s founding document is legislated into meaninglessness. The prosecutor knows this. He knows it is upside down from the way it it is supposed to be, but he prosecutes cases made against free men for the exercise of that right. He does this knowing he is imprisoning good men, ruining lives, and devastating families, but he doesn’t care. To him, the exercise of power over other men is its own reward. Is this man, the prosecutor, a “Good man”, or a “Bad Man”? That lasted longer than I thought it would. It always seemed predictable that if the 2A, which largely prevented government control over what happens at one end of the gizmo was moderately untouchable, the other end would start garnering more attention. Wonder where the SB Tactical decision will come to rest on this spectrum. And how many years a rubber crutch tip on a buffer tube is worth. One is simply not permitted to ask those questions, Longbow of either “Law Enforcement” or the “Legal” system. My first rule is to never, ever trust someone in “authority”. The future looks dangerous as well as stupid. If the communists win in the election next week, bad things are coming down the pike that we can’t even imagine. I’m talking about communist governors in FL and GA as well as the House. It’s later than we think and we must use what little time is left wisely. Yeah, it was always obvious to Me that the ‘pistol brace approval’ by ATF was a Ruse to eventually be used to Entrap certain Gun Owners by ‘reversion’ to the original definition of an SBR. I suppose unless you can cite a Revenue (or ATF) Ruling you’re on your own, unless you get a private determination letter (sort of like in tax disputes). Any federal agency like the ATF needs a constant stream of reasons to exist, reasons to continue to lobby for additional funding, reasons they are still “necessary” and should not be disbanded by executive order. Reasons to ask for a budget increase for the next fiscal year. And if you an agency whose work interfaces with law-enforcement or the like, there is nothing better, bureaucratically-speaking, than a “serious new problem” which can be used to justify more funding, more regulations and more clout for your agency. It’s all a giant self-licking ice-cream cone! If you work for them, what’s not to like? Create problems with the left hand, “solve them” with the right – it’s pretty much their MO. Whether it is bump stocks or AR-style pistols, the ATF can move the goal posts anytime they like, secure in the knowledge that the higher-ups won’t call them onto the carpet. Create an entire class of “criminals” where none existed before. 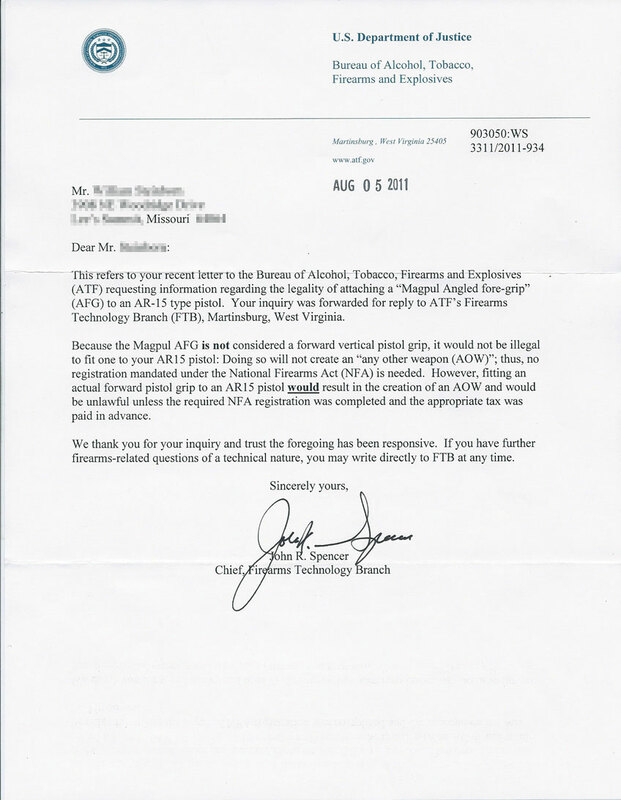 The ATF are far from the only federal agency engaged in these underhanded tactics, sad to say. Quite a while ago, someone wrote a Book titled “Three Felonies a Day” (sorry, forgot the Author’s Name) outlining how the “Laws” of the feral government have become so Numerous, Convoluted and OCCULTED, that Every Citizen, Every Day, is ‘violating’ on average, three ‘Laws’ that could get them Jailed Forever in the federal Gulag, for doing seemingly Innocuous things that have no apparent “Criminality” (or Harm to another Person) whatsoever. These “Malum Prohibitum” or Fiat “Laws” are Contrary to every concept of “Justice”, but because their Existence and Effect on Liberty has been so carefully Hidden (yes, Occulted) that the Majority of People don’t have a Clue. The only Way this Changes is when, (not if) the feral government Collapses under the Weight of its Own Corruption; I believe we are beginning to See this, as for Example, the ‘reveal’ of the “Just Us” system where the minions of the Swamp commit Egregious, Public Crimes (think clinton and the Home Computer used for Official, ‘Classified’ Business) and their Crimes are Completely Ignored, and ‘Covered for’ by the very same ‘officers’ who should have them Arrested. And Yes, Donald Trump, as President, is Derelict in His Duty as the Chief Executive, in Not having that individual Prosecuted. Until Patriots start terminating federal scum “with prejudice”, Freedom will continue to be eroded. Recall that Waco started out as a stunt by ATF to enhance their case for an increased budget. You are currently reading "And You Thought The ATF Interpretation On Pistol Braces Was Safe, Did You? ", entry #20181 on The Captain's Journal. This article is filed under the category(s) BATFE,Gun Control and was published October 28th, 2018 by Herschel Smith.